Easter weekend my Serbian Orthodox family and most others means visiting relatives in villages, lighting candles for the health of loved ones and the peace of those deceased, attending Velik Petak (Good, literally big, Friday) service, rusticating in weekend houses, dyeing many eggs, and spending quality time with friends and family. It was a wonderful weekend mostly spent outside enjoying a warm spring in the 60s and 70s. On Friday my host parents and I went to a Velik Petak service and lit candles. Aesthetically, the main difference between a Catholic or Protestant church and an Orthodox one is the decoration of icons (holy images). Icons adorn the walls of Orthodox churches with their name written in an ancient form of cyrillic. Each Orthodox family honors a saint and often in their homes they have an icon corner with a picture of their saint, Christ, and Mary. Another difference between the churches is that there are no pews in the Orthodox church so through all services people stand. This church is located in my neighborhood, Trošarina. Even though it's just a ten minute bus ride to the city center, it really looks and feels like a suburb and a separate community from the rest of Niš. 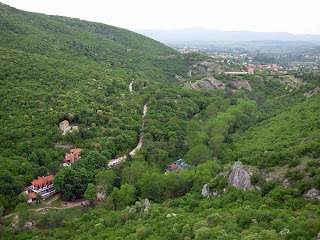 On Saturday my host parents took me to a few of their favorite spots around Southern Serbia. They share a quaint weekend house with their extended family along Bovansko jezero (lake Bovan), a man-made lake situated between two Serbian towns Aleksinac and Sokobanja. First we walked through the center of Aleksinac and then we checked in on this house while, of course, relaxing with some tea and coffee. This was the beginning of a field of yellow flowers, my favorite kind. I've seen so much of Serbia this year through the program excursions and generous host families, and most of that has been from the seat of a bus, van, or car. It's been beautiful in fall, winter, and spring and a lot of times I look forward to visiting other parts of Serbia for the drive itself. Nearly all the drives through Serbia consist of seemingly endless countryside, mountain ranges, and untouched nature. Not that Serbia's land is especially desirable, but I wonder how long it will stay unindustrialized. Next we drove a bit further to another town called Sokobanja (direct translation: falcon's spa). I think the city center of Sokobanja is my favorite one yet. All towns and cities in Serbia and, if I'm not mistaken, the better part of Europe as well have city centers free from exhaust and automobiles where pedestrians rome freely. The favorable weather shed nice light on my opinion of this city center but I think regardless it would be a favorite. As we walked through I noticed again how Serbians in the south flock to the city center on weekends, opposed to those from the north who tend to stay inside or visit relatives in villages. 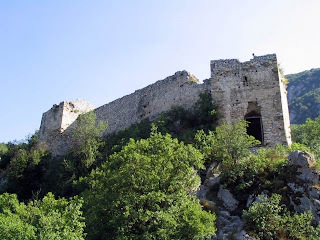 After late-lunching at a kafana (typical Serbian tavern-like restaurant), we visited Sokograd, the fortress in Sokobanja. This fortress was stunning, and unlike most of the other fortresses I've seen which are located in cities, this one was in a forrest setting bordering a small town. The air in Sokobanja is supposed to be especially clean which justifies the second line's claim: come old, go young. Twas a blissful two days and next I'll write about Easter Sunday!